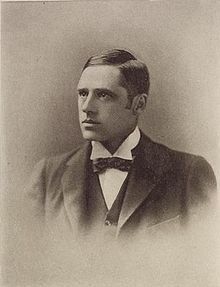 Even though he claimed he wasn’t in complete agreement with Henry George, Banjo Paterson must rank as one of the most articulate and influential Georgists in Aussie history. Living a life rich in powerful experiences, Paterson saw too much and knew too much to be otherwise. Andrew Barton Paterson was born at Narambla Station near Orange, New South Wales, the eldest child of a Scottish immigrant from Lanarkshire, who had arrived in Australia in the early 1850s. During his childhood he was in constant contact with drovers, bushrangers and teamsters, becoming familiar with the bush recreations and feuds which appear in his work and went on to be part of the Australian Bush Myths. After concluding his education Paterson gained a position as a clerk in a solicitor’s office where he served the customary articles, and at length was admitted as a solicitor in 1886. In 1895 Paterson suddenly became a literary luminary when his first work, The Man From Snowy River and Other Verses, was greeted with adulation and within a week had sold out. In England his work was compared to that of Rudyard Kipling, who was later to become Paterson’s firm friend. It ran through four editions in the following six months and today still outsells any other Australian collection of poetry. Paterson was a keen amateur sportsman, crocodile hunter in the Northern Territory, and a pearl-diver in Broome. He went to the Boer War (1899 – 1902) and the Chinese Boxer Rebellion as a war correspondent before returning to Australia to become first a roving lecturer on the Boer War, on which he was now considered an expert. His life as a world traveler enabled him to see at first hand the politics and economics of the world from which Australia was totally isolated. In 1902 he deserted the law completely to become a professional journalist and was appointed editor of the Sydney Evening News. He drove ambulances in France early in World War I and then was commissioned as a lieutenant in the A.I.F. and spent the remainder of the war in the Middle East, subsequently gaining the rank of major. Paterson, during his time at the Bulletin, became attached to the senior contributor John Farrell, who was an ardent advocate of Georgist reforms and who formed the Single Tax League of which Paterson was for a time a member. Poet, journalist, lawyer, jockey, soldier, farmer – Banjo Paterson became one of Australia’s dearly-loved literary figures who, even if he had only written Waltzing Matilda, would have left his mark upon our literary landscape. But he left much more than that, including Clancy of the Overflow (1889) to name but one more. May he now be recognised for something that, in the final analysis, was even more important – his outspoken attempt to expose outrageous privilege.